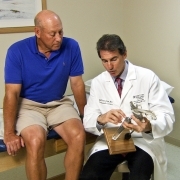 The Exeter Hip Stem is thought by many to be the “industry gold standard” prosthetic stem for hip replacement. Developed in 1969, the Exeter Stem reached one million implantations by 2010 and, among its accolades, received the award of special commendation by the British Orthopaedic Association. More Exeter Stems have been implanted than any other type, and today it remains the number one, most implanted hip stem in the world. I have been implanting the Exeter Hip Stem in my patients since 1996 and the results continue to remain among the best in my practice. The brain child of two amazing collaborators, surgeon Mr. Robin Ling and engineer Dr. Clive Lee still profess that serendipity was a significant factor in their original design. Named after the city in England where they created the stem, the Exeter’s remarkable long-term success is largely due to its polished, tapered design and its ability to behave like a wedge or self-locking taper. 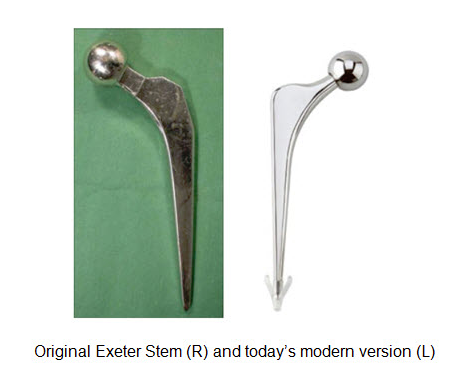 In autumn 1970, the first Exeter Hip Stem was implanted at the Princess Elizabeth Orthopedic Hospital in Exeter. The Exeter Hip Stem is shaped into a double taper. This original, signature shape has not changed and was designed to be implanted in acrylic bone cement where it engages, self-tightens and continues to move very slightly. The Exeter’s outer metal surface is highly polished and this feature has proven to be critical to its success over the years. The modern or Universal Exeter Stem was introduced in 1988 and although more sizes have been added to the selection, the stem’s shape and mirror finishes have not changed. Several factors have contributed significantly to the success of the Exeter Stem. 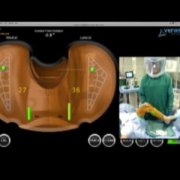 Due to the stem’s shape and surface finish, results are favorable even in the hands of surgeons who are not very experienced with total hip replacement surgery. I believe this helps to explain its remarkable longevity and immense worldwide popularity. Also, compared to many other stem designs, it is less expensive to manufacture. The Exeter Hip Stem was designed to be implanted in acrylic bone cement which is polymethyl methacrylate (PMMA). I like to think of the bone cement as a plastic grout or a grout with plastic qualities and it too must be considered an “implant.” During hip replacement surgery, I meticulously clean and wash the upper femur just prior to implanting the bone cement. The goal is to force the cement into the tiny crevasses of the prepared upper femur to create the best mechanical interlock possible. Think of it this way. Imagine meticulously cleaning the grout lines of your bathroom tiles to remove dirt or debris prior to placing the cement grout. After wiping off the excess grout from the tiles, the grout that remains between the tiles helps to secure the tiles by mechanical interlock. The grout is not glue and actually doesn’t stick to anything. Likewise, the acrylic bone cement that is forced into the small spaces in the bone is initially held in position mechanically. What we’ve learned is that later the bone can and does grow into and around the cement. To improve the process of interlocking the cement into the bone, the medullary canal just below the hip stem is plugged. This allows the cement to be pressurized prior to placing the stem and then further pressurized with the introduction of the stem into the cement. The original designers described how the double taper shape of the Exeter Stem would “further increase intrusion pressures when inserted into the bone cement,” thereby further improving the depth of cement penetration and the final strength of the construct. We also create a bubble or void at the bottom of the stem with a special “cementralizer.” Like the medullary canal plug, it too is made of PMMA and is designed to keep the end of the hip stem completely surrounded by cement and not let the stem’s tip touch the inner aspect of the femoral cortex, which would result in a cement mantle defect. It’s critical that a “complete” mantle of cement is created around the stem because a defect could potentially allow debris or fluid pressure access to the surrounding bone and lead to bone loss or osteolysis in the future. The cementralizer also creates a void or air space below the tip of the stem, all of which helps to explain the Exeter Stem’s remarkable success and track record because it prevents the very end of the tip of the stem from actually loading the cement. Picture a person who’s hip is reconstructed with an Exeter Stem walking or climbing stairs. The forces generated from this activity naturally try to drive the hip stem down and backward. The stem engages the supportive cement mantle and moves down into it, just slightly, which then self-tightens. Because the stem is polished, the acrylic cement (like the grout in your bathroom which does not stick to the smooth tiles) doesn’t adhere to the stem. As the stem slips, the forces generated are dissipated axially (downward) and radially (outward like “hoops” radiating out from the stem, called “hoop stresses”). The tip of the stem moves within the air bubble created at the bottom of the stem, so the end of the stem is not end-loading. The radially directed hoop stresses force the acrylic or plastic cement to deform slightly outward, further compressing the bone cement into the bone. This helps to prevent loosening and bone loss (osteolysis and osteoporosis), while maintaining bone strength. This process – the acrylic cement expanding outward and further compressing the bone – is called “plastic deformation.” The plastic property of the bone cement explains how the cement absorbs the stress, subtly changes its shape and doesn’t break. During periods of rest, such as sleep, the property within the acrylic bone cement that allowed for deformation without fracturing recovers (“stress relaxation”), so that in the morning when the person gets out of bed and is active again, the process can begin all over. The act of stair climbing or standing from a seated position also creates tremendous backward (or posteriorly) directed forces. The complex trapezoidal shape of this stem counters these forces and helps to prevent this backward migration. Most cemented stems when they migrate move into varus. Imagine the tip of the stem moving outward and the upper part of the stem moving in the opposite direction. To my knowledge, the Exeter is the only stem that actually moves in the other direction (into valgus) and this also might account for its remarkable longevity and track record. The Journal of Bone and Joint Surgery (Br) 2009 reported on the first 325 consecutive Exeter Universal Stems ever implanted. The first stems were implanted in March 1988 by multiple surgeons, with differing experience over a two year period. At 17 years, there was a 100 percent survival rate, failure being defined as noninfectious loosening. Radiological review showed excellent preservation of bone stock in the upper femur and no failures of the femoral component. Another important published study published one year prior in this same prestigious journal describes the 10-17 year experience of the Exeter Universal Stem in patients 50 years or younger. Survivorship of the stem from all causes was 99 percent and no stem was revised for aseptic (non-infected) loosening. The Exeter Universal Stem performed well, even in young, high-demand patients. This study challenges the common misconception many people and physicians have, particularly in America where so few stems are cemented, that a cemented stem should be reserved only for the elderly and sedentary and not for younger and more active patients. I began this blog stating that I’ve used the Exeter Universal Stem extensively since 1996. I literally have implanted several thousand of these stems. I also stated that they still provide some of the absolute best results I have in my practice. Today, I continue to reconstruct approximately half of my primary or first-time hip replacements patients with an Exeter Stem. I “press fit” a different stem in the other half. My decision about which stem and technique to use is based on each individual patient’s unique anatomy and the biomechanics I need to create with the reconstruction. 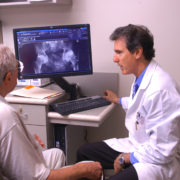 I often look specifically at the degree of bone loss or osteoporosis and the amount of offset between the femur and where I need to place the new hip joint center. Although other factors play a role in my decision, both techniques and stems perform exceptionally well when the operation is done correctly, the hip biomechanics are optimally recreated and the soft tissues are protected. I completed my residency in 1989 from a prestigious and very busy program in the U.S. At that time, it was thought that a press-fit type, bone ingrowth stem would survive longer because it would not loosen. Because of this mindset we barely were given any instruction about cemented stem techniques. This was not unique to my program and unfortunately, this trend continues today in many teaching programs throughout the country. Also, because placing a non-cemented stem eliminates the whole process of femoral canal preparation and cementing, it’s easier and quicker. Being able to perform the surgery more quickly and “more efficiently,” has become the “economic” mantra. In Europe and other parts of the world, economic factors were and remain different and which has aided their experience and expertise with cemented femoral stems. So what is the down side to the Exeter Stem? Some patients’ specific anatomies and bone structures are much better served by press-fitting a non-cemented hip stem. Likewise, there are many other patients who are more appropriately reconstructed with a cemented Exeter Stem. I think it’s important that the decision is not made solely on the surgeon’s limitations in using one technique or the other. As with cemented hip stems, non-cemented stems also are available in a variety of sizes. Typically, as the size gets larger, the femoral offset (the distance from the mid-longitudinal axis of the stem to the middle of the ball) increases and the stem gets longer. As people age, their bones change shape. The medullary canal widens and the density of their bones decreases (osteoporosis). When reconstructing the femur of a patient with these normal age changes, a large size press-fit stem often is required, which can make optimizing hip mechanics impossible at times. Because the stem is larger, that part of the stem which is impacted down the femur to achieve bone ingrowth is larger and longer. Everything in our world has a measurable degree of flexibility. Engineers and scientists define and quantify this as a modulus of elasticity. The stiffer the substance, the higher the modulus. A diamond has a very high modulus of elasticity, whereas a piece of rubber a very low modulus. Following this line of thought, the cortical bone that makes up the femur has a measurable flexibility or modulus. As it turns out, the modulus of bone cement closely matches that of cortical bone. 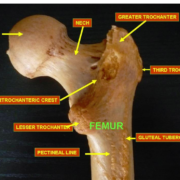 When a femoral stem, which is metal and hence has a very high modulus (much stiffer than bone) is implanted down the upper femur, some patients experience activity related discomfort in the thigh, even if the tip of the stem is not touching the inner aspect of the bone. This thigh pain is due to a mismatch between the flexibility the natural bone and the implanted stem. Typically, in a person with a big medullary canal and thinned bones due to osteoporosis, a larger sized stem (the larger or thicker the stem, the more stiff or higher it’s modulus of elasticity) is required and this “mismatch discomfort” occurs even more frequently. We see this very rarely with a cemented stem because typically the stem is much smaller and is implanted in cement whose flexibility nearly matches that of the bone. As stated previously, successful joint replacement depends on selecting the right surgeon who has the experience to choose the best prosthesis and procedure for you. 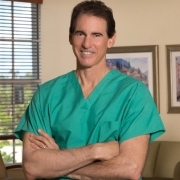 An orthopedic surgeon who is highly experienced in hip replacement surgery brings valuable expertise and typically has built an experienced team ready to assist. Your surgeon also should know from personal experience with and repeated use of any prostheses, which are optimal, safe, long lasting and provide the best results.